The sudden change of weather always amazes me. One minute the day is bright and sunny, with the promise of many more days that are alike to follow. The next minute, the skies turn a threatening black, as thick clouds build up. You know there is one mighty storm on its way. And today it came - signalling the start of our annual summer rainfall. Typically we have beautiful, hot days and in the later afternoon the clouds build up. The Highveld (the are where we live)is an area that frequently gets thunder and lightning storms. 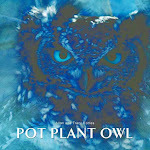 Poor Pot Plant Owl lay in her nest, covering her eggs as best as she could. With the heavy rains, there isn't much chance of Pappa hunting, so they both go a little hungry tonight.